My Major Project is posted…the end is near! brainstorm and come up with a project idea. Though we worked together, our projects were somewhat independent. As you know from my previous posts, I decided to focus on students and how we can build them into Digital Leaders. This idea sparked for me when I heard Jennifer Casa-Todd speak to our Connected Educator group during a skype session. 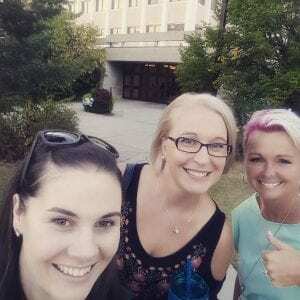 For those of you that have not heard of her, she is a Canadian teacher, author, and presenter who spreads the message of empowering students through social media. She believes in teaching students how to use social media appropriately and for learning, rather than the many inappropriate uses. 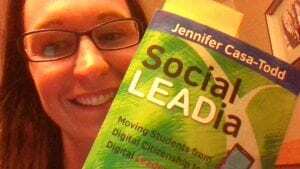 I have used her book, Social LEADia to help guide me and encourage me toward the goal of teaching my own students how to be Digital Leaders not only within our school, but also online! I dove right in! I highly recommend this book as it will change the way you look at not only social media in the classroom, but also how you use technology in the classroom. I am psyched as I will be able to meet Jennifer Casa-Todd at an upcoming Connected Educator meeting in May! I cannot wait to pick her brain and come out with some new ideas and motivations to encourage me to keep moving forward! this semester to just check-in, swap ideas, brainstorm, or ask for help. I really am grateful for having them in such close proximity as it helped to keep me motivated and focussed on my goals. We actually recorded one of our meetings, to give you an insight into what our discussions sounded like…this was only a little rehearsed! One driving factor in this assignment was the idea of changing, or re-working, our existing “Acceptable Use Policy” to include characteristics of a “Responsible Use Policy”. Everything I have read suggests this is the way to go as it empowers students by outlining what they should be doing online and with technology rather than telling them everything they should not be doing online and listing all the consequences that will ensue if they make a mistake. School should be a place to learn, grow, and make mistakes. That should include with technology. Again, Jennifer Casa-Todd created a great, and short, Youtube video outlining the differences between these two policies. I included it in this post for your viewing pleasure. I have to say, I was pretty impressed with my end-product. Today I submitted a rationale for my project, a 5-day unit plan I created on PowerPoint jam–packed with digital integration and engagement, and a sample Responsible Use Agreement. I liked the word “agreement” better than “policy” because it should be something our students and teachers/administrators are agreeing to. I plan to work this project into my teaching practice and am pretty excited to see how it all plays out! Thank you so much for joining me on this journey. As always, I look forward to your comments, questions, or insights! Before I leave you for this term, I thought I would leave you with one last video. I thought it was pretty great, though it did not make my presentation, sadly. Enjoy! Hey Jen…..can I just say that your end project is truly amazing and such a wonderful resource for all students. Thank you for being an integral part of integrating technology into our school and our division. We have all created a resource that is tangible and real. Regina Catholic has taken such a keen initiative with technology and I am so grateful for the many people who choose to forge forward.